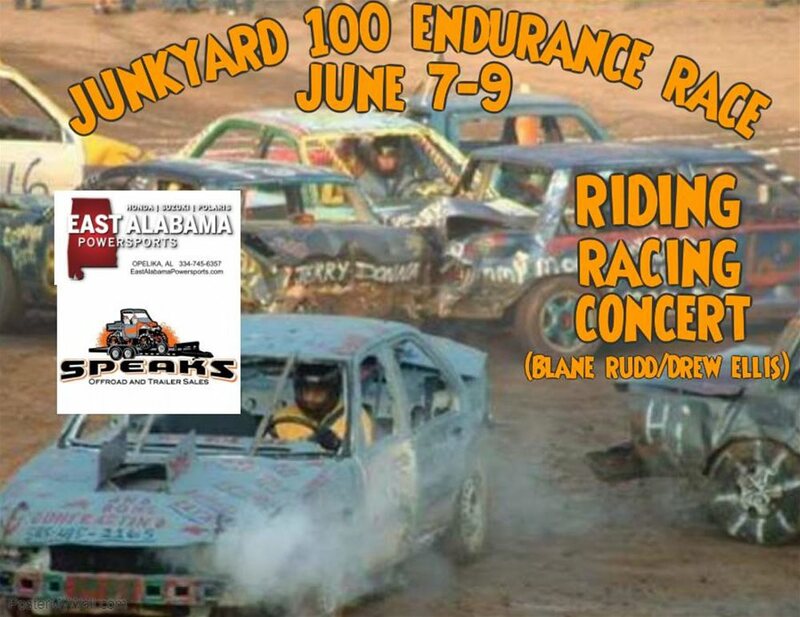 The Junkyard 100 Endurance Race will be June 8, 2019, at Boggin' on the Plains. The Inaugural Junkyard 100 Endurance Race is your chance to showcase your racing skills and compete for the Winner Take All prize of $1000! Come for a weekend of riding, racing and live music! This is a small car endurance race on a dirt track with races on Saturday and Sunday (depending on the number of cars that enter) and concert on Saturday night featuring Blane Rudd and Drew Ellis on Saturday night. Space is very limited! CONTACT US ASAP VIA A PRIVATE MESSAGE ON FACEBOOK OR CALL 251-979-2308 OR 334-354-0609 TO ENTER. Several cars have already entered.